Flight VA216’s heavy-lift Ariane 5 is shown in the ELA-3 launch zone, ready for liftoff with the ASTRA 5B and Amazonas 4A satellites. 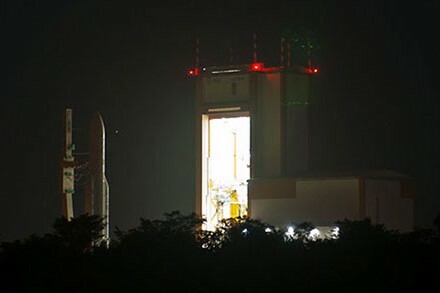 The final countdown is underway for Arianespace’s next Ariane 5 launch, which will carry the ASTRA 5B and Amazonas 4A telecommunications satellites into geostationary transfer orbit this evening. Designated VA216 in Arianespace’s launcher family numbering system, the mission is to be performed from the Spaceport’s ELA-3 launch complex in French Guiana – deploying the two passengers for satellite operators SES and HISPASAT during a flight lasting 34 minutes. Total payload lift performance for the Ariane 5 is nearly 9,580 kg., which includes some 8,755 kg. for the ASTRA 5B and Amazonas 4A payloads, along with the launcher’s dual-payload dispenser system and satellite integration hardware. 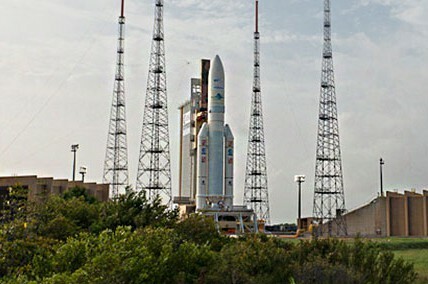 Today’s flight will be the 73rd Ariane 5 launch overall and second mission for Arianespace’s heavy-lift workhorse in 2014.